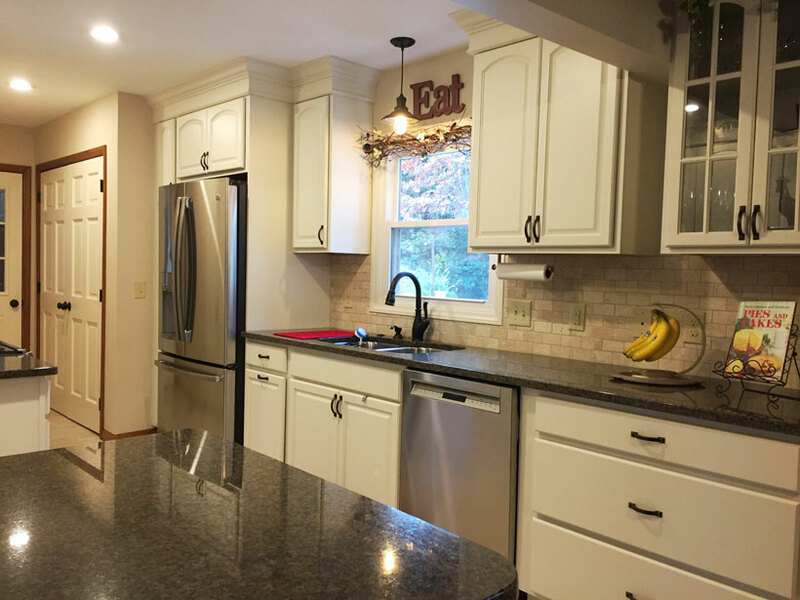 The Johnsons came to Vision Design Build Remodel with the desire for freshening up their kitchen and re-designing its layout for better functionality. 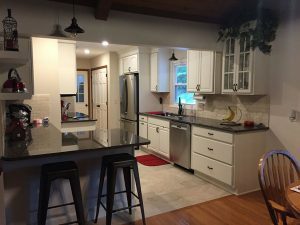 Our clients’ requirements for their kitchen have shifted through the years, plus the space was outdated in appearance and the appliances were very old. 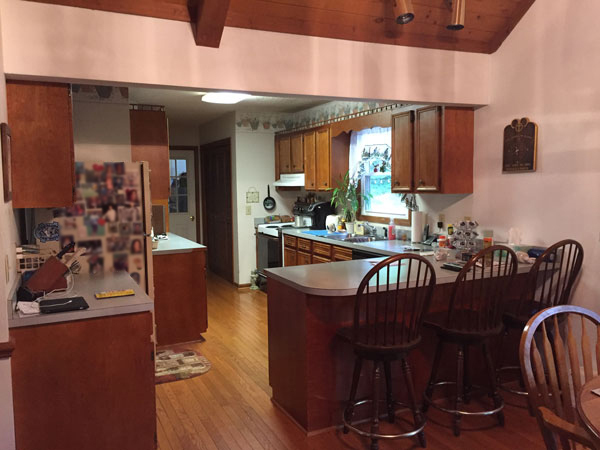 The countertops were plastic laminate; the placement of the appliances was awkward for cooking; the kitchen sink was a drop-in variety with a very small faucet; and there was just one light fixture—a big fluorescent light hanging from the antiquated popcorn ceiling. A couple years ago, the Johnsons built a new porch and deck on the back of their house and currently enjoy spending lots of time relaxing in that beautiful outdoor environment. They discovered, however, that whenever they came indoors to grab something from the kitchen, the breakfast bar got in their way. 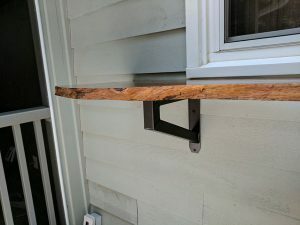 It was blocking the traffic flow from the porch to the kitchen and to the garage door as well. Vision Design Build Remodel’s answer to this dilemma was to move the breakfast bar to the opposite wall, where it is now out of the traffic flow. Also, we narrowed the breakfast bar so that it seats two people, rather than three. Since they are now empty-nesters, the Johnsons needed only two bar stools and they really appreciate how the kitchen aisle has been widened. We created a highly functional work triangle for our clients by relocating their new stainless steel appliances. An induction range with a microwave overhead is installed directly across from the refrigerator, sink, and dishwasher. The refrigerator is counter depth and therefore offers more aisle space in the kitchen. The look of the new kitchen is clean and stylish. Heartland maple cabinets by Homecrest extend a warm welcome with a French Vanilla finish. They are much taller than our clients’ original cabinets—extending all the way to the ceiling to provide more storage. The upper cabinet doors are arch-topped for an elegant appearance, while a glass doored cabinet displays beautiful dinnerware. One of the wide undercounter drawers includes a docking station to charge electronics. To the right of the refrigerator is a convenient rollout double trash can, and to the left is a floor-to-ceiling pantry pullout. A washer and dryer are tucked behind new classic closet doors that replaced the outmoded louvered doors. The Tropic Brown granite countertops have a streamlined pencil-round edge. Tumbled marble Subway Mosaic tile forms the highly textured backsplash. A handy magnetic docking spray head adds to the luxury of the Leland pull down kitchen faucet in Venetian Bronze by Delta. Next to the faucet is a matching Delta soap dispenser, along with a push button switch for the InSinkErator garbage disposal. 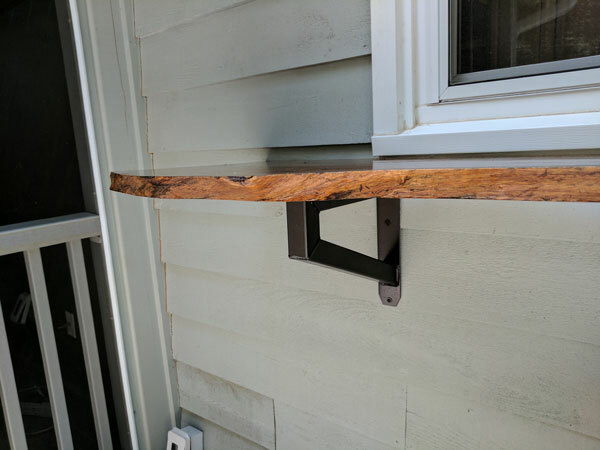 Our clients finished a large wooden slab attached with custom brackets fabricated to their home’s exterior wall under the kitchen window, forming a passthrough bar from the porch to 08the kitchen. Other fantastic updates included replacing that old popcorn ceiling with a new smooth drywall ceiling that made it possible to install recessed lights. The Johnsons selected lovely industrial-style pendant light fixtures in an oil-rubbed bronze finish that coordinates with the cabinet hardware, door knobs, and kitchen faucet. See more photos of this beautiful transformation on Houzz. 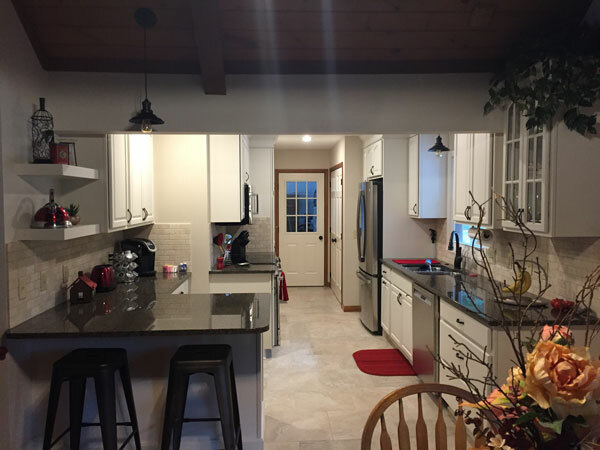 Some challenges our Vision Design Build Remodel team expertly overcame during this remodel were a dropped beam that made it somewhat difficult to extend the kitchen. Also, there was the delicate process of removing the existing hardwood floor in the kitchen and installing the new 18×18 Elevated Beige ceramic tile floor, while carefully protecting the existing hardwood floor in the dining room. Vision Design Build Remodel was able to update the entire space according to our clients’ wishes and on budget. The Johnsons love their new kitchen and they are telling all their friends and family how happy they are with it. It gives them so much more space to entertain their kids when they come home.